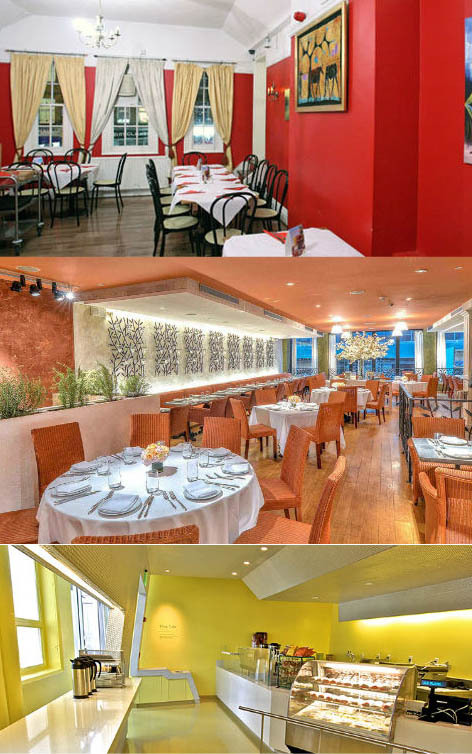 Restaurant Design Inspiration – using ‘warm’ colours. Colour psychology within the restaurant business is something well worth taking into consideration in the first stages of any interior design project. It is estimated that customers entering a restaurant will make a first impression of it with a matter of seconds; so how does colour help created this impression, furthermore, how does it bring in business and which colours mean patrons enjoy their visit, spend money and hopefully return? Are certain kinds of establishments more suited to particular colours? Getting to know a little about the psychology of colour and understanding how to choose colours that complement each other is a key step in the initial stages of any restaurant design and within the food service & restaurant industry generally. When looking for restaurant design inspiration, wall colour schemes and accessories should not be chosen in an arbitrary fashion as it appears there is an element of science involved in the process of selection. This, so much so, that studies have shown colours can even boost or decrease customers’ appetites, incredible though that sounds. It is said that they can have a wholly negative effect on how diners feel, so it is important to recognise that colour choices could affect the success of your new establishment when creating the branding and conveying the unique message you wish to give out. Colour, then, is not just about ambience and aesthetics of the overall look, it something that can also affect sales. Take RED for example: fast food restaurants, looking for a fast turn over of tables would be making a safe bet choosing as red. It is a stimulant colour that serves its purpose for an outlet that relies on quick turnaround and quick continuous dining, this we already know. Red is undoubtedly an attractive colour that is tempting to use, but it needs to be done wisely for other types of venues as it can be rather aggravating too. Similarly, ORANGE catches people’s eye in a good way. Orange supposedly creates a surge of enthusiasm on meeting the eye but carries less of the negative effects red can sometimes produce. If you are thinking in terms of bright colour that is not potentially irritating then a well-chosen shade of orange could be the one. Keeping within the ‘warm’ colour spectrum, YELLOW is believed to be spiritually uplifting. An obvious choice then? Well, no, not really – the correct shade must be chosen to avoid making the mistake of creating the total opposite effect. Yellow green shades for instance are mostly displeasing and too bright a yellow can be unsettling and distracting, particularly at an eaterie where adults frequent with children. Generally, bright yellows give off a vibe that is not conducive to helping people sit peacefully and relax. The colour can look lovely in a Mediterranean-themed bistro cafe that sells to quick lunchtime diners looking for an environment that offers an escape from grey skies though. Overall, warm colours are suited more specifically to casual eateries such as bistros and cafes and places with a high table turnover. Nothing should be ruled out though as colour psychology is not an exact science. If your restaurant design inspiration includes the use of the warm colours as a main attraction, your interior designer can help you make it work. Restaurant Design Inspiration – using warm colours.